Plant-based diets including vegetarianism and veganism have been around for thousands of years, though they’ve more recently begun to gain popularity with the general public (1). In fact, a plant-based diet can have a wide array of health benefits for its followers which is why it seems its popularity has grown so quickly (2). From the treatment of diabetes mellitus, hypertension, and high cholesterol to its positive effects on mental health, there’s no shortage of benefits offered by veganism. But did you know that a vegan diet can also contribute to healthy hair growth? In this article, I’ll introduce the vegan diet and the many ways which it contributes to a healthy hair growth cycle. This will include a look at the scientific studies to back these claims. Let’s dive in! 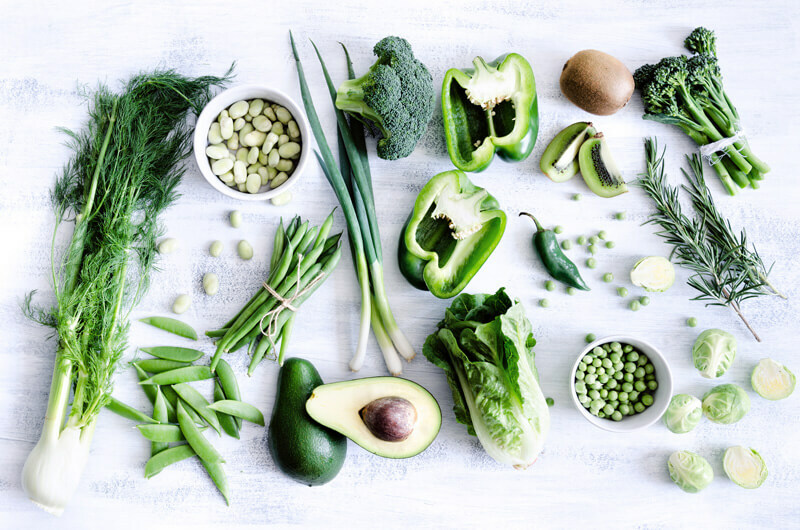 The vegan diet, also known as veganism, is an eating plan which involves sustaining from the consumption of meat, fish, and animal products including eggs and dairy. Veganism is the strictest variety of vegetarianism. The majority of this diet focuses on fresh produce and whole grains, but it also includes legumes, nuts, and seeds. While sometimes considered controversial, this diet has been shown to reduce the risk of various health conditions and even prevent obesity (2, 3). Veganism offers many health benefits, but one benefit that is often overlooked is its role in hair growth. Let’s look more closely at how a vegan diet can improve your overall health and, as less directly, your scalp and hair. Did you know that individuals with Androgenetic Alopecia (AGA) are at a higher risk of developing high blood pressure (hypertension) than their non-AGA counterparts (4)? While the link isn’t entirely known, the newest research on the topic suggests that a mutation of the Fibroblast Growth Factor 5 (FGF5) gene may be the cause (5). But what does this gene have to do with hair loss? 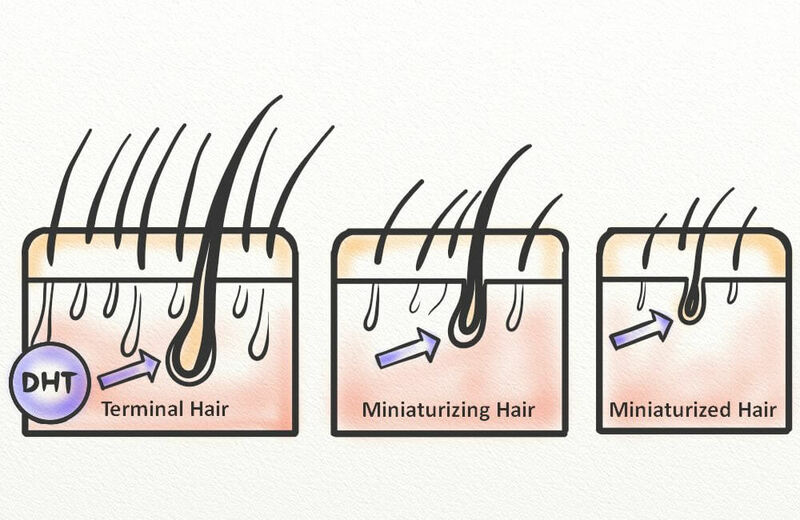 There are various genes that play a role in the hair growth process. FGF5 is one such gene, and its major contribution is in the determination of hair length in humans. However, this gene has also been implicated in the development of hypertension (6). All of this to say there is a link between pattern hair loss and hypertension. So if AGA patients are at a higher risk of hypertension, it makes sense to lower that risk by combating hypertension and perhaps also interrupting the progression of AGA. One way to achieve this is with a diet change. More specifically, with a plant-based diet. A vegan diet has been shown to reduce risk of hypertension by up to 75% when compared to an omnivorous diet (2). This is even better results than a vegetarian diet which reduces the risk by up to 55%. But when inflammation occurs over a long period of time, it can be indicative of a deeper issue. For hair loss sufferers, this issue is likely to be sensitivity to DHT which occurs at the hair follicles. In men and women with AGA, the hair follicles are sensitive to the androgen hormone DHT. This sensitivity leads to miniaturization which causes excessive shedding and eventual balding. If left untreated, the baldness that results can be permanent. Reducing inflammation is the best way to combat AGA hair loss, and there are many ways for you to do so. These include blocking DHT and removing allergens from your environment. However, veganism is also a viable solution. Plant-based diets such as veganism have been shown to reduce inflammation (7). The exact reason for this is unknown, but the reduction in inflammatory biomarkers including IL-6 and hs-CRP have shown these claims to be legitimate. Cholesterol levels are an important indicator of health, but did you know that high cholesterol may contribute to the progression of hair loss? A study published in 2002 showed that androgens can be produced from cholesterol (8). This means that high cholesterol levels may contribute to higher levels of androgens including DHT at the hair follicles. This is bad news for anyone with AGA as the increased presence of DHT will trigger further miniaturization of the follicles and increase the rate of hair loss. That’s not to mention all of the poor health effects that high cholesterol levels can have on the body, including an increased risk of Coronary Heart Disease (CHD) (9). So, what can you do to lower cholesterol and protect your scalp from further balding? Eat a vegan diet. People who follow plant-based diets tend to have lower serum cholesterol (10). This is very likely due to a decrease in consumption of saturated fats and cholesterol and the increase in fiber (11). Blood sugar spikes and Insulin Resistance (IR) are hallmarks of such metabolic conditions as Type II Diabetes and Polycystic Ovary Syndrome (PCOS), but they also have an interesting link to hair loss (12). The cause for this association is unknown, though one possible theory is that high blood sugar levels increases follicle sensitivity to DHT. And while certain conditions can make it difficult to get your blood sugar levels under control, one of the best ways to do so is with dietary changes. Diets that are high in fiber and low in saturated fats and sodium are ideal for people with IR. One such way to achieve this is with the vegan diet (13). Animal products contain saturated fats as well as cholesterol. These contribute to cardiovascular diseases and can make it difficult for anyone with IR to keep their blood sugar levels in check. A healthy vegan diet though, which focuses on high fiber and low-glycemic foods, can keep blood sugar levels stable throughout the day. This will result in less spikes and a healthier lifestyle overall. If you’d like to make the switch to a vegan diet, you may be overwhelmed by the restrictions. However, it’s possible to follow this eating plan for the long term if you follow the tips below. Protein is an important macronutrient – one that the body uses to build and repair tissues – and one that vegetarians and vegans must make special effort to incorporate into their diet. Why? Because protein is found in higher amounts in meat, fish, and animal products than it is in produce and grains. That doesn’t mean that you still can’t get the appropriate protein intake on a vegan diet, though. 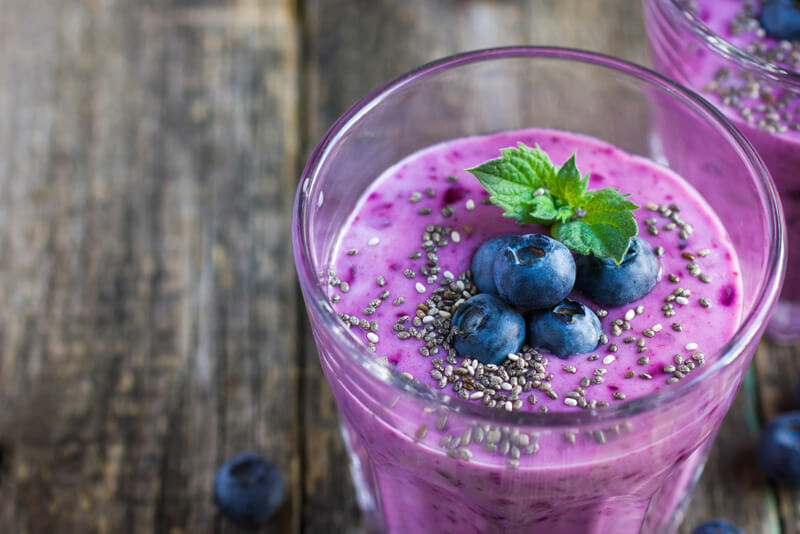 If you find yourself struggling to consume your RDI on a regular basis, you can also incorporate smoothies into your routine. These delicious drinks can be packed full of protein-rich foods such as nuts, seeds, and even whole grains, and they’re also filling and easy to make. Produce and grains tend to make up a large part of the vegan diet. But processed grains such as white breads and quick cook oats don’t contain all of the nutrients your body needs. That’s where whole grains come in. A whole grain is any cereal grain that contains all three original components: the endosperm, the germ, and the bran (15). This is in contrast to refined grains which only contain the endosperm. Whole grains contain higher amounts of vitamins and proteins and the bran (the outside layer of the grain) contains protein and fiber. These will keep you full longer than refined grains as your blood sugar levels will remain stable for longer. Whole grains also naturally contain iron which is often added to refined grains (known as fortification) after the refining process. There’s no doubt that prepared vegan meals – such as those found in the freezer aisle – have made the daily lives of vegetarians and vegans much easier. However, these meals tend to contain high levels of sodium and sugars and they don’t offer the variety your diet needs. While it’s okay to rely on these meals every once and awhile, it’s important not to make them a regular habit. Instead you should focus on eating whole foods which can be found along the outer perimeter of the grocery store. These include fruits and vegetables, nuts and seeds, and whole grains such as quinoa, bulgur, millet, buckwheat, barley, and brown rice. If you’re still looking to have convenience during the busy weekdays, you can also prepare many of your meals beforehand and store them in the fridge (for up to three days) or in the freezer (for up to three months). You’ll still have the convenience of frozen dinners without the added sodium, sugars, and fats. If you’d like to get started with the vegan diet, it’s best to begin by slowly incorporating more vegan-friendly foods to replace meat, fish, and animal products such as dairy and eggs. While you can certainly make the transition quickly – cutting meat and animal by-products from your diet from the very start – this isn’t usually recommended. After all, it’s easy to become overwhelmed and discouraged when you make such a drastic lifestyle change. One of the best ways to make this transition is to replace your usual meat-based meals with vegan recipes. You can even use meat replacements that are often found at health foods store if that makes the transition easier for you. Remember that you want this to be a long-term change for you and, as such, you should go easy on yourself as you make the changes. The vegan diet is not for everyone, and it’s best to speak with your physician before you make the change. This is especially true if you have a chronic medical condition that requires close monitoring, or if you have a history of anemia (low iron levels) or malnutrition. If you are pregnant or breastfeeding, it’s important to speak with your obstetrician about your diet so they can monitor your nutrient and vitamin levels. For men and women with diabetes and hypo/hyperglycemia, it’s important to continue to monitor your blood sugar levels. If you currently take any prescriptions for preexisting conditions, continue all medications (including those for blood sugar, blood pressure, cholesterol, etc.) unless your doctor advises otherwise. While plenty of diet fads have come and gone in recent years, plant-based diets such as veganism have been around since antiquity (1). And there’s no wonder! 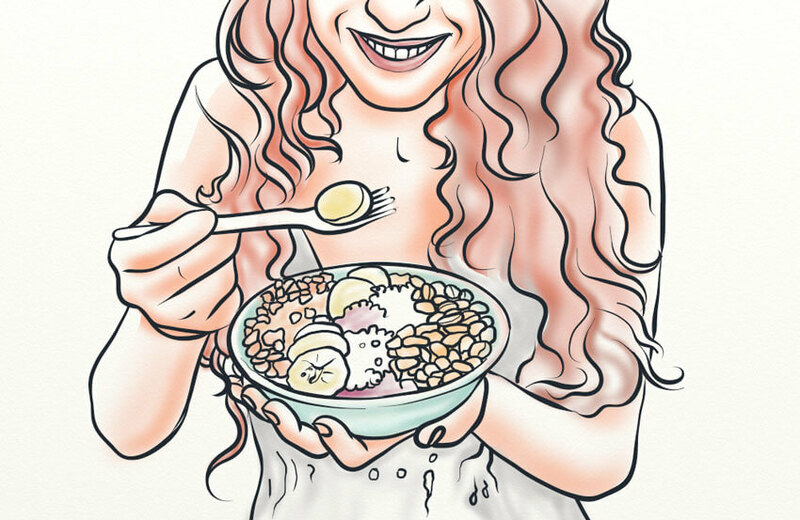 Veganism provides an array of positive health effects one of which is healthy hair growth. Does this mean a vegan diet will solve all of your hair problems? Absolutely not. Veganism is just one step in the right direction. The truth is that treating and reversing hair loss requires a lifestyle change overhaul. You must be committed to making lifelong changes – including the cessation of smoking and drinking and an improvement in your overall health – if you want to see positive results. And while the vegan diet can help you to achieve a healthier body, it doesn’t necessarily mean it’s the right diet for you. Interesting blog, good information given about vegan diet for hair gain and how it is effective. Was very helpful, thanks for sharing the blog with us. Nice and informative blog…. thanks for sharing with us. Very helpful for understanding the reason behind the hair fall and also help to how to prevent hair problems in the future.